Philosophy began, on the sunny shores of the city of Miletus, as science. The first philosophers attempted to describe the processes of natural phenomena, and this has largely been the legacy of philosophy in Europe and the Arab world. But before Aristotle cast his discerning eye at the heavens and earth, began sifting and winnowing all that sensory data into categories, and cemented this scientific tone to the practice of philosophy ever after, there existed different methods. 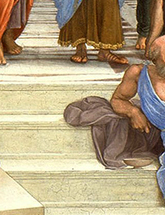 Plato is considered to be the father of philosophy. Though only a relative handful of later philosophers had adopted his literary style of philosophical writing (Friedrich Nietzsche was one of them, prompting a modern commentator to note that Plato and Nietzsche are the only philosophers that contemporary people read for fun) he remains famous for the character of Socrates in the Platonic dialogues and the focus that he had carved out for philosophy. Philosophy, according to Socrates, was the pursuit of discovering how to live a better life. This knowledge resides in every living person, he posited, and the method of mining this hidden treasure was knowing how to ask the right questions. Philosophy, as Socrates famously described, was not about finding the answers, but about asking the right questions. The reason I bring this up is because this phrase, repeated so often in our culture that it has become a platitude (no pun intended), seems off to me. Today, I was thinking about some problems in my life that have gone unresolved for several years. Applying my brain – as a human being, my greatest tool – to the task of solving those problems, I have failed daily and repeatedly, though I had struck at the issues from every possible angle, seemingly asking all of the right questions. Some problems I have so over-thought that my mental machinery became all dented, hot from friction, and out of whack from crashing repeatedly at full speed against the same wall. In those situations, when reason has failed me or I have failed reason, I found it best to forget about such problems altogether. After a still winter night I awoke with the impression that some question had been put to me, which I had been endeavoring in vain to answer in my sleep, as what-how-when-where? But there was dawning Nature, in whom all creatures live, looking in at my broad windows with serene and satisfied face, and no question on her lips. I awoke to an answered question, to Nature and daylight. Appealing as this kind of escapism is for a while, that’s not the way of philosophy. The effect of the two methods, forgetfulness (or, ignorance) and philosophy, can be the same: the urgency of the question melts away. But the methods are different. Socrates asked of his peers generic questions: what is beauty? what is justice? what is the good? The answers were hard to come by, even for Socrates, but he said that they weren’t as important. Socrates pressed his interlocutors with those questions, and the discussions frequently lasted well into the night. In the Symposium, the people he was talking to had gotten drunk and fallen asleep, though he himself was still conversing with a handful of them until the sun rose in the morning. Drunk and happy, his friends drifted into dreamland where the questions of Socrates did not follow them. But they would awake, one assumes, better people for having gone through Socratic basic training. From my experience, it doesn’t seem to me that “asking the right questions” is itself enough. Maybe that phrase is a mistranslation from ancient Greek. Maybe I am not asking the right questions in my own life, that’s definitely a possibility. But what I know for certain is that the way I ask the right questions is different from the way that Socrates asked them. He had a method. He sought out others. And understanding for him was a communal process. Reading Plato’s dialogues, I get the sense that philosophy, the asking and answering (or, at least, revealing falsehoods to be wrong answers), is a journey. There is a place, a tribe, and a guide. The path from ignorance to love of wisdom has many steps after the asking. One needs to know how to travel down that road. Perhaps, what Plato meant, or at least what I’ve come to believe myself, is that philosophy is knowing how to proceed to answer the right questions. If I remember correctly, Socrates DID answer all of his own questions – and with much affectation and self-righteousness, too, judging by tone & rhetoric 🙂 – even those for which the answers are “hard to come by”. I don’t think that “asking the right questions” as an approach assumes that you should stop there – I think the implication here is that with the right questions, the answers will formulate themselves. It’s an issue of methodology, where the emphasis is on dynamic probing of an issue from different perspectives to avoid hasty assumptions or being satisfied with the first answer that fits. For example, drawing an analogy from science: if you see the sun rise and set, and all you’re looking for is AN explanation, a logical one would be that sun revolves around the Earth. Now, if you apply the “asking” approach – the requirement here is to continue investigating until the “Truth” can be proven. Katya, you are right. It’s not just about asking the right question, but rather how to react rationally to the question and the alternate points of view. How does one develop a foundation for accepting or rejecting the arguments, and make personal choice based on it?